40 Facts About Nigerian Music Star, Wizkid – Ayodeji Ibrahim Balogun. 1) His Real Names are Ayodeji Ibrahim Balogun. 2) He was born on July 16, 1990 in Lagos into a family of 6. He’s from Lagos State, Nigeria. 3) He is the last and only son in the family. 4) His favourite Color is Black. 6) Wizkid got his first car in 2011 Black Honda Accord i-VTEC. 7) Wizkid started off singing at 11 under the name ‘Lil Prinz’. He formed a group back then at 11, Glorious Five. 9) His Group, Glorious Five went on to release a 7-Tracker Album and released the album in the Church. 11) He changed his name from Lil Prinz to Wizkid in 2006. 12) His first break-out in the Industry was his feature on MI’s Fast Money, Fast Cars in 2009. MOBO – Best African Act. NEA – Best New Act. City People Entertainment Awards – Best New Male Artist. 2012: NEA – Best R’n’B / Pop Artist. Hip Hop Revelation Of the Year. Channel O – Most Gifted Video Of The Year. 14) His Break-Out single was ‘Holla At Your Boy’. 15) Wizkid was in the studio when 2face Recorded ‘Grass To Grace’ and Soundsultan recorded Jagbajantis. 16.) Wizkid has a 2-year Old son, Boluwatife Balogun. 17.) Wizkid’s Baby Mama, Oluwanishola Ogudugu just rounded off her NYSC. She studied at Houdegbe North American University, Cotonou. Her Buzz at School then sprung up her affair with Wizkid after he performed at the School which resulted in a child – Boluwatife. 18.) Wizkid dropped out of Lead City University in 2011 into his 3rd Year where he was studying ‘International Relations’. 19.) Wizkid’s first International Collaboration was with Akon on Don’t Dull (Remix). 20.) Wizkid ‘Ayo Ibrahim Balogun’ was a student of Ijebu Ode Grammar School. 21.) Wizkid is currently in a relationship with half-caste, Tania Omotayo. 22.) He has a Lekki Home stipulated to worth #140million. #6m Blue Volkswagen Convertible and Hyundia Sonata. 24.) Wizkid has performed alongside World Class Acts like Chris Brown, Akon, Young Jeezy, Kardinal Official. 25.) He popped #300million Champagne at his 23rd Birthday (this year). 26.) He currently has over 697k followers on Facebook making him the second highest followed Nigerian Musician after D’Banj. 27.) He currently hold the record for the Highest paid Pepsi Ambassador in Africa. 28.) He presently has Endorsement Deals with MTN. 29.) Wizkid is the youngest Nigerian artiste to put out an internationally recognized album. 30.) In April 2012, E.M.E signed a joint deal on Wizkid with Akon’s Konvict. 31.) He floats his own Record Label, Star Boy with acts: Maleek Berry, Legendury Beatz, Mutayo and more recently, L.A.X. 32.) 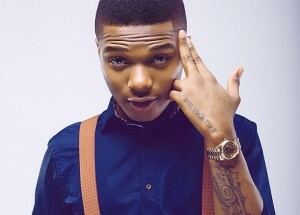 Wizkid’s Hit Track – Azonto is 3rd Place on the non-American songs of 2013 according to FeedBuzz.com. 33.) Wizkid was booked all through December of 2012, sometimes he had to shuttle between 4-5 shows. 35.) One Of Wizkid’s biggest track in 2013, Samba was recorded & produced in 1hour by Seasoned Producer, Sarz. 36.) He is currently the Most Influential African artiste on Twitter due to his Popularity base having over 1 million followers. 37.) He had his first ever recording with OJB Jezreel at 11. 38.) Wizkid has more collaboration than any other Nigerian artiste (both Local & International). 39.) His first solo album was released in 2011 with E.M.E titled, ‘Superstar’. 40.) His next and second album is titled, ‘CHOSEN’ is due for release anytime soon. Wizkid has gotten a total of 24 Nominations for top Major Awards, out of which he’s won 13. He just recently got 3 Nominations at World Music Awards. Wizkid is reportedly Nigeria’s Freshiest Artiste + 1 – Wizkid was featured on Channel O / Forbes List of Africa’s Most Bankable Acts, He was placed 5th in Africa. Five places above E.M.E Boss. Ayodeji Ibrahim Balogun (born 16 July 1990), better known by his stage name Wizkid (sometimes stylised as WizKid), is a Nigerian recording artist, songwriter and performer. He was born on 16 July 1990 in Surulere, a residential and commercial area of Lagos. He watched 2 Face Idibia record Grass 2 Graceand watched Sound Sultan record Jagbajantis. A year later, Wizkid started recording. His parents weren’t receptive of his music from the onset. In order to gain his father’s trust, he had to work hard and spent lots of time in the studio.